We're back racing at Minden, one of the world's best soaring sites. 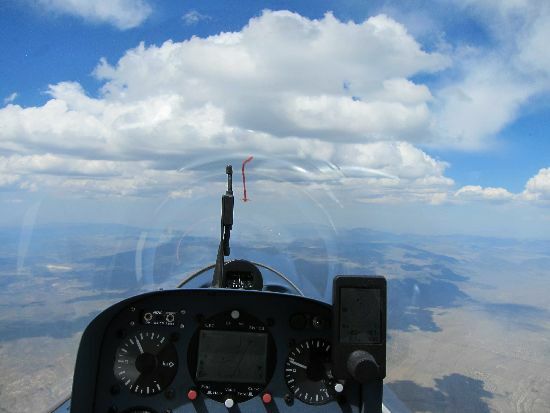 We're hoping for a repeat of 2012's spectacular soaring (see Dave's blog from the 2012 Minden contest for some background on Minden soaring, terrain, and weather). This will be my 7th national contest at Minden, and I'm still learning about the site every time I fly here. We have a strong field of 20 competitors, including at least a half-dozen former USA nationals winners. About half the competitors here have been on the USA team at the world championships. Should be a challenging contest. I'm flying my electric-powered Antares 20E with the short 18-meter wing-tips, among a half-dozen powered gliders. I arrived before the formal practice days. June 5th had challenges from thunder-storms in the Sierra, whose afternoon blow-off darkened the area around Minden and caused some interesting winds (storm inflow and outflow). On Friday June 6th I took off at noon for a short flight, and by the time I got past Mt. Patterson the area to the south and west was in shadow from storm blow-off. I followed a street south-east to the north end of the White Mountain range, and was rewarded by fabulous lift. At Bishop I thought about turning around, but it looked nasty towards home so I kept going, expecting the storm to dissipate a bit before I returned north (glider pilots are ridiculously optimistic about these things). The fantastic cloud street continued south on past the Owens Dry Lake, where I finally turned around. Unfortunately, another storm developed in the Sierra west of Bishop, and north of Bishop the cloud was down below top of the Whites. I headed northeast, working around the bad stuff, following high dissipating clouds that still provided weak lift, and bumped north towards Hawthorne NV. It was quite dark under the storm blow-off overcast, but near Hawthorne on the high ground south of Mt. Grant, I found a weak climb for a couple thousand feet. Coasted over Hilton Ranch, and found another weak climb north-west of Hilton. 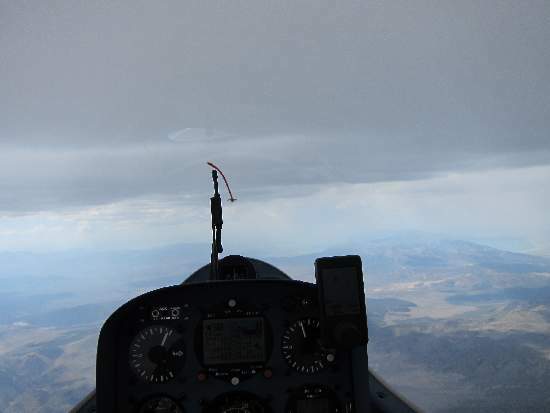 I had altitude to final glide home, except the Pine Nut mountains were in the way... Over Farias Wheel airport, I finally resorted to a brief motor run to get over the Pine Nuts and glided home. OLC says I flew 660km. While conditions on the ground at Minden were benign all day, Truckey gliderport (just north of Minden) had some minor damage from a thunderstorm micro-burst. 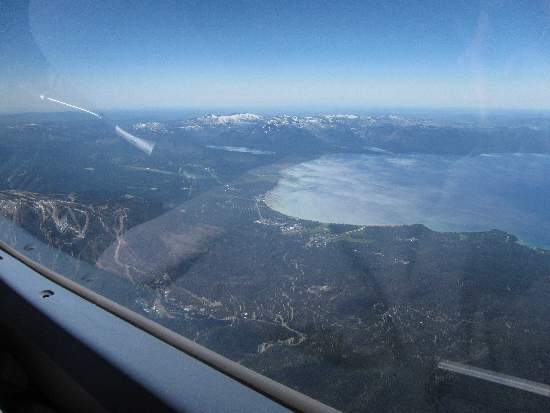 Saturday was a fine soaring day over the Sierra (I didn't fly). Jim Payne managed just over 1000km flying a couple laps on the Whites and Sierra solo in the unballasted DG-1000M, though he did run the motor from Hawthorne to get home. Jim and Jackie hosted a social at their house in the evening, featuring Jackies awesome cherry cobler (with cherries from their trees in Rosamont); thanks guys! Sunday's first official practice day started very late and blue. A bit of scraping around to get out of the valley here, even one relight. We had a short 2 hour TAT task with 10 mile cylinders around North Mono and Hilton Ranch. Contrary to good racing strategy, I started out the top of the cylinder early and by myself, a bit conservative as there were no cloud until the top of Mt. Patterson, not reachable direct from the top of the thermal at Mt. Siegal. I followed the high terrain across Desert Creek Peak, the north bowl in front of Patterson, and finally found lift on the north flank of Patterson looking at Sweetwater airport. Not a super-fast climb, but it seemed prudent to stick with it until well above Patterson's crest, from where I easily cruised over the spine to the nice cumulus clouds at the southern edge, and climbed at 6 knots to above 17,000. From this vantage I watched all the little gliders scrambling around low with a few aborting to Sweetwater airport. There were beautiful clouds over the Sierra (as weatherman Dan Gudgel explained, from a convergence enhancing convection). Unfortunately the remainder of our task area was blue except a lone wisp over Potato peak. I topped off at the Potatoe peak cloud, and cruised in alarmingly still air to North Mono. Turned expecting to bump a wisp enroute to Hilton, but it didn't yield much of a climb. Good racing strategy would have been to final glide around the remainder of the course, just nicking the Hilton turn area. I figured it would be fun to overfly Mt. Grant and find some lift in that area. But it was a calm dead glide over Mt. Grant, then homewards across the high terrain west of Hilton ranch, and a big loop searching for lift over the high ground north of Desert Creek Peak and the southern flank of the pine nuts. 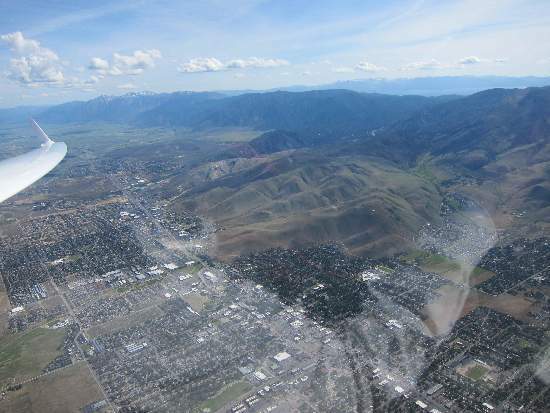 Presently I was low, dumping water and working a weak thermal with Sean Fidler in 7T west of Topaz airport, trying to get high enough to fly through the cut in the mountains where Rt 395 heads back towards Minden. Very slow! Gary P7 Ittner won and explained this was a good example of why one should never give up. Gary spent 3 hours struggling around Minden, trying to get high enough to start, and finally got away planning on a sight-seeing mission into the Sierra instead of flying the task. Having finally escaped and cruising down the Sierra in late afternoon, Gary realized that the North Mono cylinder touched his position in the Sierra, so he turned and did a final glide around the remainder of the course (just nicking the Hilton cylinder)! Sean and Tiffany Fidler and I took the day off and toured around Lake Tahoe. Absolutely stunning scenery which I had never before seen from the ground. Now we're well rested for the start of racing Tuesday AM. 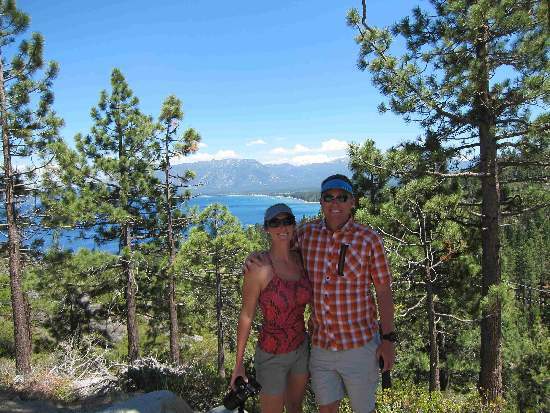 Sean and Tiffany Fidler hiking at Lake Tahoe, and Eagle Falls. Nice clouds in background! Jim Payne and Keith Essex both did over 1000km out of Minden. They both went down the Sierra, up the Whites, then east. They needed to get clearance and fly through some of the Fallon restricted areas to avoid a storm coming back west towards home. Rick Indrebo YC won practice day 2 at 97 mph, with 14 knot climbs on the Sierra and fabulous cloud-streets lined up with the course lines. Gary started out the wrong cylinder and says that makes up for winning the first practice day (which is considered bad luck). Pilot's briefing commenced with a moving tribute to Doug Armstrong, who for years served the soaring community with weather forecasts and education. We all miss him. Forecast on local news calls for thunderstorm activity from Mono Lake to Bridgeport in the afternoon. Dan Gudgel's briefing shows us additional moisture in the entire task area, and his map of enhancement by low-level convergence and high-level divergence highlights the Mono Lake area and also out around Fallon; thunderstorms thus expected first in Mono area 1-2PM and later out towards Fallon. Cloudbases around 15k-16k, 4-6 knots at 2PM, up to 7-9 knots at 5PM, westerly flow out of the Sierra in late afternoon. Boy it is hot! Easy climb out to above 10,000 and cooler air while loitering before start. Descended and climbed through the top of the start cylinder at 1PM after a big gaggle, and despite planning to use them as markers, as usual I took a different path. Typical top-out at Mt. Siegel at the south end of the Pine Nuts, step up on Patterson, but today there is a high street along the Sierra leading to the back of the Mono Lake turn area, not too hard to choose the route! Stunning scenery, sorry I didn't get any decent photos this leg. Quick run down south, and another street leads directly to the second turn area around Hawthorne. Easy run into the southern part of the Hawthorne turn cylinder, with the area in the Hawthorne valley and Walker Lake blue and lifeless as usual. Street Across Mono Lake towards Hawthorne. Click on images for higher-resolution. I expected that the clouds on Mt. Grant would work after turning, but unfortunately they didn't and I wasted a lot of time searching. The next leg was directly over the Yerington valley, which is usually a sinkhole. I made an enormous detour south over the high ground, and the clouds didn't work. Eventually found a slow climb low in back of Mt. Seigel 15 miles left of course - aarrgggg... Meanwhile, a nice line of clouds had developed over the north end of the Yerington valley closer to the course line - aaarrrggg... At higher altitude the thermal eventually strengthened, and I topped out and bounced cu along the Pine Nuts, crossed over the Dayton turn, and found a line of lift running into the next cylinder around Tiger. Kept bouncing, turned, and followed a line of wisps south towards the last cylinder at Sweetwater. As forecast, there was OD (over-development) and virga around Patterson and Sweetwater, plus a small cell dropping Virga on the route home to Minden. I turned well over final glide once I saw a path home around the virga, excessively nervous about the route home. Consequently flew the last 30 miles at 140 knots... Slow flight of 87 mph with the time-wastage on third leg. DJ flew direct on course second leg and did 100mph! Dan showed us the 5PM satellite picture which showed total cloud-cover south of Patterson. Excellent tasking by John Godfrey and advisors to run us around the best part of the sky! 1,000 hours on My Antares! Today I passed 1,000 hours on my Antares. It has been much more reliable than other motor-gliders, but still requires significantly more attention and repairs than an un-powered glider. In future I'll try work up some reliability statistics. Anyway, looks like I've got my money's worth from this machine! Forecast today is for high winds in the PM, cloud bases 1k less than yesterday (bases yesterday were above our 17,500 foot limit). We should launch around 12:30 today, with the westerly wind from the Sierra commencing around 2PM and increasing quickly. Blue north and east, possible OD again around Mono Lake area. Task is three turn areas: first to Benton station with a radius so we can run the northern part of the White Mountains, then up to Hilton Ranch by Mt. Grant, and last a big turn area around Crestview (south of Mono Lake). Before launch there is already substantial development to the south, and I release early in a 6 knot thermal. Top of the start cylinder has been raised to 12,000 feet which makes getting out of the Minden valley a bit easier. Easy climb with the gaggle out the top of the start cylinder, then fabulous cumulus all the way from Mt. Siegel across Patterson, Potatoe peak, and onwards. Some trouble lurked towards Benton with a gap in the lift and some virga, so I slowed up a bit to arrive on the Whites not too far below Boundary Peak, and took a 4 knot climb until I could easily transition to over the peaks and run south to the back of the cylinder. Pilots more familiar with the area ran up the flank in ridge/thermal lift but I'm not comfortable doing that... Some dodging virga to Hilton, then due west to the convergence line running south-east from Patterson into the last turn area. Fast run down, but a wall of virga prevented going deep into last turn, so I turned and came home early for 99.1mph but 18 minutes under the 3:30 task time. Due to a spectacular blunder, no points for me today! Street home on Day 2, climbing straight ahead at 8.4 knots through 16,500 feet. Potatoe Peak is on the right. This is the classic convergence that sets up at the north end of the Owens Valley in the vicinity of Mono Lake. Gary Ittner P7 won the day at 103 mph, no problem with the virga before Benton, to the southern part of the first cylinder. A bit slower northbound towards Hilton, kept getting down to 14,000 looking for a strong climb. Followed the convergence down south into the last turn and back for a fast run home. After I got up, I didn't quickly find the strong lift, but after all the flailing I planned to try stay above 14,000 and climb higher prior transitions between waves. I ran the primary south along the Minden valley, finding it got stronger south of where I expected. Ran off the end of the wave and turned downwind towards Coleville (I did not want to turn downwind where the wave was strong, which guarantees a trip through strong sink). In the Coleville valley I tried to find the wave at the same wavelength as in the Minden valley, but didn't find anything, so I dropped back and took a weak climb then moved into weak wave in back of the Pine Nuts. Punched forward into the secondary in the Minden valley, which ran direct to Carson City (unfortunately, I did not find the 10 knot strong section of the secondary used by the fast guys). At Carson, oddly, it seemed like the secondary almost converged with the primary, so I turned left and flew down the primary til abeam Minden, dropped back for the turn, then moved into the primary again for the 2nd lap. Repeat but this time with enthusiasm! 2nd lap I found wave after turning Coleville, much closer to the mountain east of Topaz lake then I expected. Oddly, wave lift continued north-west into the Minden valley, south of the pass where 395 cuts through the Pine Nuts. This lap I pushed up to the primary, turned Carson City, and planned to drop back to Topaz. Wimped out and turned for home ridiculously high at Double-Spring Flats. Slow! Only 65mph, but lots of fun, and no drama. View of Lake Tahoe from the wave. Heavenly Ski Area on the left. Note the wind lines on the lake - wind was 40 knots up in the wave. Click on images for higher-resolution. Winner Rick Walters did 111 mph! Rick has flown this site a few times ;-) Rick said "after 6 or 7 laps I finally figured out where to go and the last lap was around 150 mph". A few flat-land pilots had their first wave experience, starting with huge anxiety and frightenly turbulent tows, then came back with huge ear-to-ear grins. Surprisingly, some top pilots with massive Minden experience had difficulty today. Again, John Godfrey and advisors did a fabulous job calling a task running us up and down the wave lines. Dan Gudgel's briefing confirmed the wave was better late yesterday and best around midnight, and will decrease through the day today. Yesterday was classified 'weak to moderate' wave strength (peaks were still 8-10 knots in spots). Today we'll have the same diminishing to weak wave in the afternoon. Thermal strength should be a bit better than yesterday. John Godfrey called a short thermal task up and down the Pine Nuts (which will also work in wave if still present). Turn areas around Dayton, south to Topaz, north to Carson, south to Double Spring Flats, then home. Gridding at noon. Sniffers had trouble (one took two relights), and we eventually launched no-water quite late. I had an easy climb into wave, spoilered down to start, and climbed easily in a 7+ knot rotor-thermal to over 14,000 feet. The wave was weak so I expected to do the task in thermal. I followed a weak wave line to the western side of the Dayton turn area, but fell out of the wave heading south. I followed the line where I expected thermals, but found nothing until past 395. Looking traces I was probably upwind of the good lift, ooops. After I struggled a bit getting back up, I changed plan and did the task in wave. And again I was silly-conservative, turned too soon in the last cylinder and overcooked my final glide. Slow at 64 mph, but a relaxing flight without drama. Rick Walters won the day at about 80 mph. Rick said he tried to follow the same line as yesterday but using rotor-thermals instead of climbing into wave, as he found the workable wave segments too short to go go fast, and the best rotor-thermals were 7-8 knots. Dan Gudgel expects thin high cirrus moderating thermal strengths. 2-4 knots at expected 1:30PM launch time, 4-6 knots at 5PM, max altitude around 13,500 feet. Possible heavy cirrus or alto-cu could kill lift. Outlook is for poorer soaring next couple of days, so we'd really like to get in a task today. Possibly Weds-Thurs get good again. Bill Gawthrop gave us a report on yesterday's non-task. He used wave in back of the Pine Nuts and a few rotor-thermals for the minimum distance. Stuart Tattersal gave today's weather briefing. There's a very strong inversion which will probably cap thermals at 14,000. Though there is morning wave cloud in back of the Pine Nuts, useable wave is not expected in the afternoon, possible weak thermals, late trigger. Models forecast quick cooling in the afternoon (resulting a short flying day), possibly due to approaching high cirrus. Kinda similar to yesterday... Tomorrow (Monday 16th) may be a wave day (Jim Payne is planning on an early launch). Task today is a 3 hour turn-area task with turns north-east to Tiger, north-west to Air Sailing (east of Reno), then south to Hawthorne, then home. We're handicapped by a large military CARF (airspace grab like TFR) surrounding Mt. Patterson and east to Hilton. The Marines are doing practice "insertions" with fighters and helicopters doing rapid descents from above 18,000 to ground level. Our task is set to avoid this area. 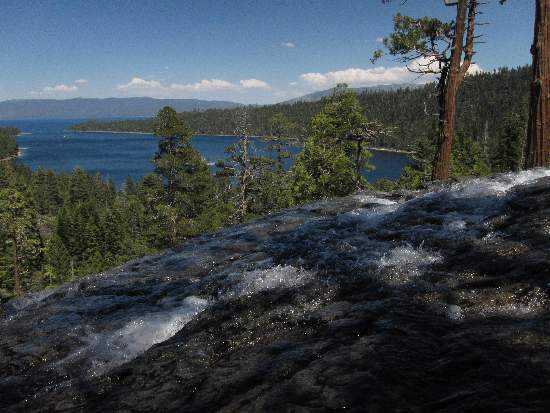 View of Carson City and Lake Tahoe from the wave after the finish. 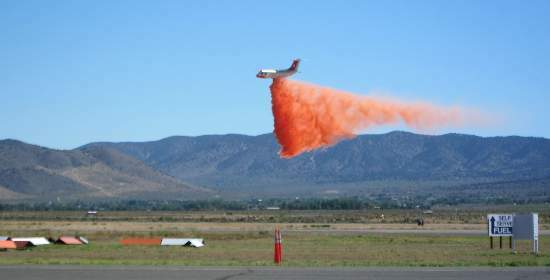 Locally-developed BA-146 fire bomber conversion dropping retardent next to the runway (testing dispersal pattern). Doug Jacobs "DJ" won at 98mph. Doug found 9 or 10 knots near Tiger and realized the task might be too short for 3 hours, and he did go almost the maximum distance. Doug got to Mt. Grant just before the OD and Virga developed and avoided the delays that caused pilots arriving later. He turned before the back of the last cylinder at Hawthorne, expecting to be 12 minutes over, but hit huge lift on the return leg and finished 3 minutes under. Dawn lit beautiful lenticular clouds, first band visible over Lake Tahoe and then downwind for several cycles, reassonably continuous. Local Reno news is forecasting 40mph gusts in the afternoon. We'll race today, but tomorrow (Tuesday) will be a rest day. Dan Gudgel briefed a great-looking wave pattern, early inversion at 10,000 feet, increasing to 18,000 feet in the afternoon. Thermal lift 4-6 knots early, increasing to 6-8 knots later, but these will be rotor-modified. A small front will pass through around launch, bringing increasing wind and moisture. Winds will increase to 60 knots at 18,000 in the afternoon (and stronger tomorrow). Congo-line to the grid area leaves at 11AM. Monday 16th morning wave. Click on images for higher-resolution. We gridded, wind came up, and race today cancelled as it was just too exciting on the ground, and forecast to get worse later in the day. The forecast seems to have been wrong, but kudos to CD John Godfrey for making the safe call.... PS: Jim Payne and Dennis Tito flew just over 1000km in the DG-1000M. Rest Day! Not a taskable day weatherwise anyway. Yesterday a weak cold front passed through, dropping rain in Minden and 3" of snow in Elko - well below freezing last night in the desert to the east. Dawn broke with frost and thin fog through-out the area which is unusual here, with still a few puddles from yesterday's rain. Dan Gudgel showed us a high north of us which will suppress the afternoon Sierra westerlies. Heating will take a while with the trapped low level cold air and residual moisture in the valleys. The optimistic NAM model shows climbs to 14,000 later in the afternoon, in our area and over the Sierra. Very light winds will help. Tomorrow will be better! Todays task was shortened to a 3:00 MAT, running up to Tiger and then north-south along the Pine Nut mountains. A painful late start and a bit of a flail climbing up off tow quickly turned to grins and strong high lift to O2 levels - 12,000 feet+. When the task opened a number of gliders were still low. I couldn't find a thermal in the start cylinder, so climbed to just under 12,000 near the Pine Nuts and flew back to the start cylinder to get going. Strong wave-enhanced lift along the Pine Nuts, followed the high ground towards Tiger, then retreated back to the high ground to top off. The direct line south to the next turn by Desert Creek Peak crossed the low Yerington valley, which was filled with thick haze. That route looked extremely unwise, so back to the Pine Nuts and strong lift. You can run along the Pine Nuts almost like ridge, but that is slower when you're down on the deck. Bounce along until a strong core, circle for a bit, bounce along... The turn is 13 miles back from the south end of the Pine Nuts, so I got as high as I could before diving off. Turned Topaz and then found a 7-8 knot thermal on the back side of the Pine Nuts. Another run north to Dayton, south to Double Springs, then what? I've got altitude to glide around the final turn Carson and home, but I'll be a little under time. Decided to just do the final glide, but ended up 5 minutes under which cost a few points. Shoulda gone back to the strong lift on the Pine Nuts, but it seemed like too big a detour. 72mph was a ways behind the 77mph winner's pace but better than I've been flying this contest! Sean Fidler won Day 6, tacking on Dayton as a final turnpoint. Three pilots tried the 2nd leg direct route through the Yerington Valley, and were rewarded with a land-out, a motor run, and an epic dump water and struggle to escape. Glad I didn't make that mistake! Dan Gudgel expects better weather than yesterday and again weak flow out of the Sierra in the afternoon so thermals will work late. Looks pretty blue. 5-6 knots at launch, 7-9 knots on task - this stuff is hard to take! Congo Line to the grid leaves at 11:00, film at eleven. Sniffers struggled a bit, task "B" called on the grid. Turn area task north-east to Tiger (east of Reno), north to Flanigan (past Air Sailing), back down to Ranch (in the Yerington valley east of Minden), Hawthorne, and return. I'm in the first launch wave after the sniffers at 1:30. Promptly fell well below relase altitude, and after I finally got up found very weak wave. That means the westerly flow is a bit more than expected and the thermals may be torn up a bit, even though the wind speed is only 15 knots or so. The task opening is really late at 2:30PM, and despite planning to start immediately with the gaggle I can't manage to climb in extremely rough thermals, and finally start by myself at 2:45. Its completely blue, no markers, and I had a terrible time getting up for the start, so I'm going to fly the minimal task in survival mode, and try to stay high. A couple good climbs running north on the Pine Nuts, long glide across the Dayton valley where the westerly wind is picking up and blowing out the thermals. As I crossed Air Sailing, the fast guys are already headed south having turned near Flanigan about 20 miles north. A bunch of gliders headed south on the Pyramid Lake side of the mountains, which I thought a bad idea, so I topped off and headed back the same route I came, where I knew there was decent lift. Crossed south across the Dayton valley to the Pine Nuts very conservatively, staying well above the peaks. Pilots who took the Pyramid Lake sight-seeing route were well behind me, but I did see some pilots low on the Pine Nuts, where the ridge will be working with the westerly wind. A brief climb at the north end of the Pine Nuts stopped at only 11,000 feet, so I bounced south, and eventually fell off the back side of the Pine Nut Mountains - way too much drama flying down the canyons into the Yerington valley. This looks horrifying but is actually within easy glide of Farias Wheel and Topaz airports. Turned south and west around the back side, managed to climb a bit, then onto the high ground separating the Topaz and Yerington valleys where I found a 9 knot thermal to 13,000 feet. Meanwhile, several of the pilots flying the front side of the Pine Nuts couldn't climb and aborted the task landing back at Minden. I resolve to stay high, bounce and run slowly towards Mt. Grant, taking a weak climb to over 15,000 over the high ground before slowly crossing the Hilton Ranch. Just nicked the Hawthorne turnpoint on the northern flank of Mt. Grant, and after another weak climb I'm nominally on final glide around the final Dayton turnpoint (but only at MC 2). I failed to take a hint that lift along the Pine Nuts was wiped out from the afternoon westerly flow, and bumped and glided to the south end of the Pine Nuts, swinging left of the courseline to Dayton. Bounced the waning lift, nicked the Dayton cylinder while still on the Pine Nuts, and turned for home. By far the slowest speed at 61mph, but really glad to finish the task. Sean Fidler 7T wins the day at 83mph, his 2nd day win, bringing him 4th place for the contest. Sean managed to not get stuck along the Pine Nuts, found strong climbs when he needed them, and did a final glide from near Mt. Grant direct to the Dayton cylinder and home. Some good pilots didn't complete the task today - John Cochrane BB, Pete Alexander 98, Tom Kelly 711 - ouch. CD John Godfrey landed out in the Duo at Dayton! Doug Jacobs finished 3rd the last day at 79 mph, and wins his 11th nationals! Masterfully flown as always. Local master Rick Walters takes 2nd, and Gary Ittner P7 third. Special thanks to all the folks that made this a fantastic competition. Airport manager Bobbi and her crew especially Mountain Mike Harbison, competition manager Reeba Combs who did a stunning job of organizing, CD John Godfrey and his advisors who called really excellent tasks in atypical weather, weathermeister Dan Gudgel, the excellent crew of tuggies and line crew, Stuart Tatersal scorer, Laurie Hardie and the Soaring NV staff (tows, oxygen, facilities), and probably a dozen more I've managed to omit. Another fabulous contest over magnificent terrain. It was a great privilege to be able to fly here in this event. Thanks all!